A few weeks ago I wrote about some of the differences between functional languages (like Haskell) and imperative languages (like C or Java). While I made some good points in this post, I don't think I gave enough credit to Haskell. After learning more about Haskell, it has become my favorite programming language. In this blog post, I will talk about some of reasons I like Haskell. Please keep in mind that I am relatively new to Haskell and the contents of this blog post are about my experience as a beginner. That being said, the intended audience of this blog post is people coming from an OOP background that are looking for something better. In this blog post I am going to talk about one of my favorite math problems. When I first solved this problem, I developed a method that can be generalized to a lot of other similar problems. The problem is as follows: Alice and Bob take turns throwing darts at a dartboard (with Alice going first). At each turn, Alice will try to get it closer to the center than Bob's last throw and vice versa. The game ends when one of the players doesn't get it closer than the other player's previous throw. Alice and Bob are equally skilled at throwing darts and they are guaranteed to hit the dart board. If we list all the natural numbers below 10 that are multiples of 3 or 5, we get 3, 5, 6 and 9. The sum of these multiples is 23. Find the sum of all the multiples of 3 or 5 below 1000. I am not going to post any solution to this problem, but instead encourage you to go check out the website and see if you can figure it out! If you think that problem is too easy, don't worry they get harder. 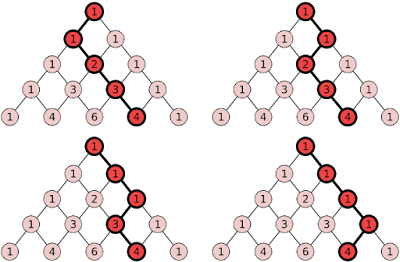 Pascal's Triangle is a triangular array of binomial coefficients, and it often arises in counting problems. In this blog post, I will present a problem that is related to Pascal's triangle and in solving it, I will derive an interesting relationship in Pascal's Triangle that you probably didn't know about. 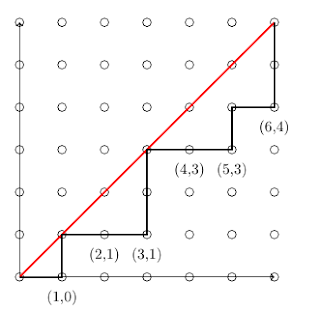 If you randomly walk down \( n \) rows of Pascal's Triangle by going down-left or down-right at each step, what is the expected value of the number that you finish on? This is the 4th math problem in a series of math problem blog posts that I am writing about. I thought of this problem as a challenging weekly problem for math club, and I will present 2 solutions. I came up with the first solution, and a friend of mine came up with the second solution -- a completely different approach that yielded the same answer. Finals week just ended for me so I'm hoping to post some new cool math problems in the next few days. In this blog post, I present a math problem that is very easy to understand what it is asking, but not so easy to solve. 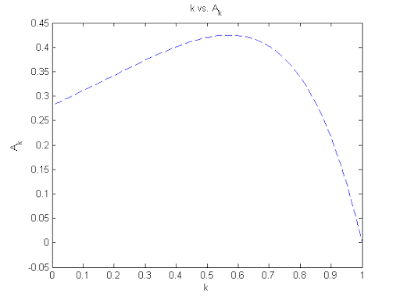 Regardless, I will present my solution, which yielded a very interesting result. In this blog post, I will discuss the solution to a very fascinating math problem that I came up with while pondering challenging math problems. The solution to this problem happens to be a really interesting combinatorics identity, and it can be used to describe some very interesting counting problems (including the number of ways to match parentheses). This past weekend I participated in the 75th annual Putnam exam. I really enjoyed this year's problem set and I thought the problems were challenging yet approachable. I submitted 5 problems worthy of submission, but I am not sure if some of my proofs are rigorous enough for full credit. 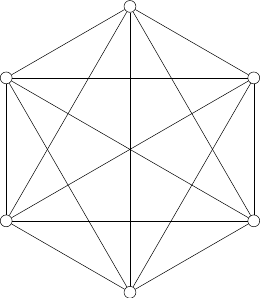 I've uploaded the problem set here and my solutions here. I was a little disappointed to not see any "2014" problem this year. In the past, the problem setters have always included a problem that directly relates to the current year, but they didn't do that this year. There was an interesting game theory problem that made reference to the hunger games movie which was pretty fitting because in the second hunger games movie that just game out, Katniss and Peeta participate in the quarter quell (the 75th hunger games), and this was the 75th annual Putnam exam. While I did not have enough knowledge of fields to answer this question, I enjoyed the witty humor of the problem setters.